This week has found the Royal Liverpool Philharmonic Orchestra half way through the Summer Pops season. 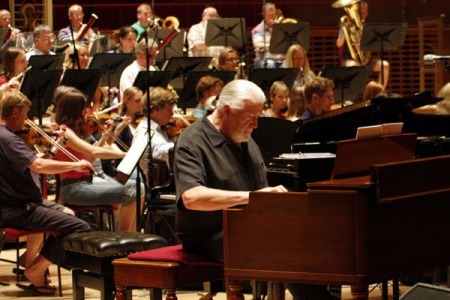 Three years ago we recorded a work by Rock Legend Jon Lord. Aside from fame with Deep Purple and Whitesnake Jon is a respected composer of orchestral music in his own right. The Durham Concerto attracted critical acclaim and held fond memories for me as the work begins with a solo flugel horn played behind the orchestra. The use of flugel horn and the siting of the solo had involved input from myself and I found Jon very receptive to my thoughts and ideas. The live premiere took place in Durham Cathedral. It was decided that I play the solo from the Pulpit with me trying to look as angelic as possible, before returning to the orchestra to play the first trumpet part. 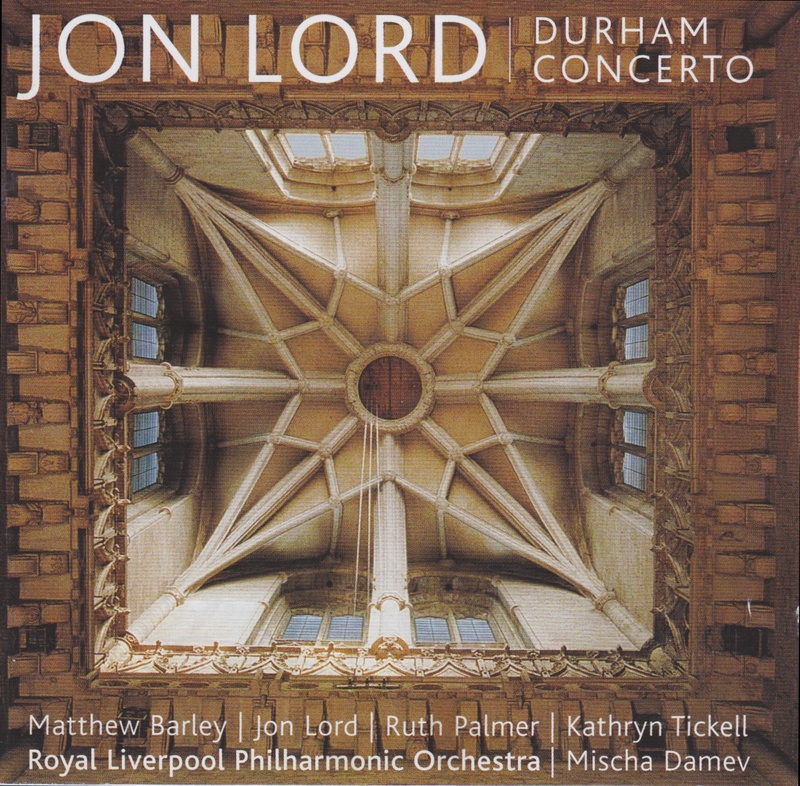 The Durham concerto by Jon Lord is available on the Avie record label and is a wonderful evocation of “A Day in the life of Durham”. The dominance of the cathedral over the city is apparent throughout the piece. People travel from far and wide to hear Jon’s music. I had some time before the coach was ready for the return journey from Durham to Liverpool. Having nowhere else to go I popped into a lovely old pub. I met an interesting ‘enthusiast’ for Jon’s work. This fellow had travelled all the way from Japan for the concert, armed with records, CDs etc which Jon Lord had duly signed for him. 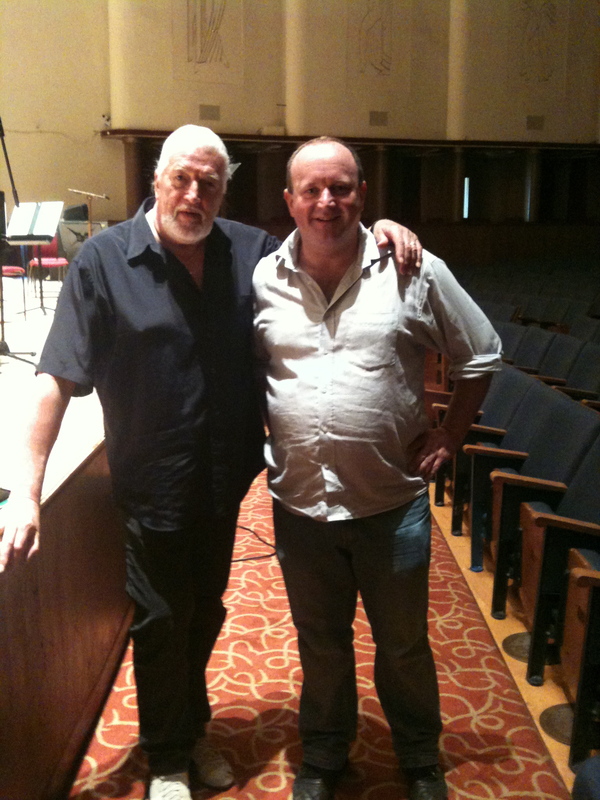 With all the above in mind, I was looking forward to a further collaboration between Jon and the RLPO during the Pops. The programme consisted of music from ‘To Notice Such Things’; The RLPO’s latest CD collaboration with Jon and his ‘Concerto for Group and Orchestra’. ‘Pictured Within’ was the encore. First performed in 1969 the Concerto for Group and Orchestra was groundbreaking and controversial. Being three years old in 1969 I am experiencing this historical music the ‘second time round’. It is exactly as described in the title. The original performance was in the Royal Albert Hall and featured Deep Purple and The Royal Philharmonic Orchestra. Jon stirred up a hornets’ nest at the time as critics found it difficult to accept that a rock musician could contemplate writing orchestral music. A little something extra! 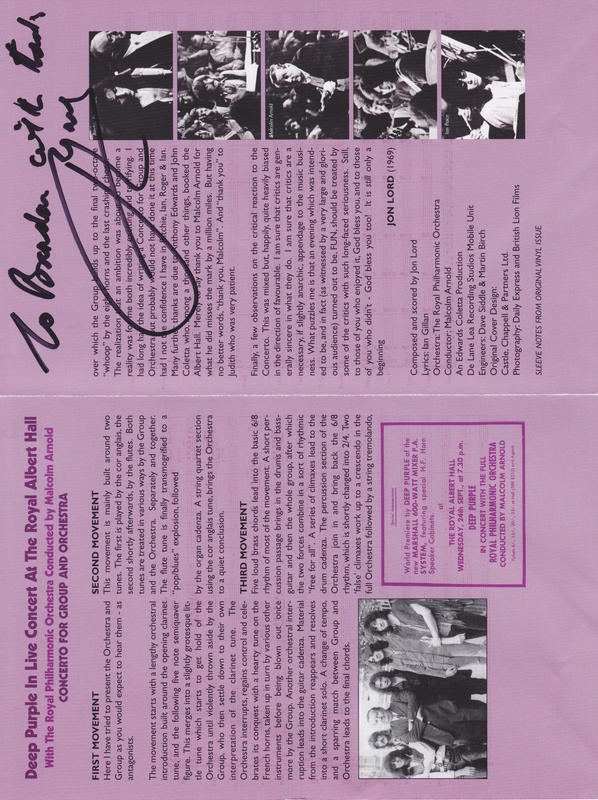 David Pigott, Associate Principal Horn in the RLPO, asked if I would have John Lord sign his DVD of the 1969 gig at the Royal Albert Hall. The cover shows the admission prices to be in shillings. Whilst chatting I forgot to tell Jon it wasn’t for me. As pictured earlier, John signed the sleeve to me. Sorry Dave! We joked that it may be worth more money now! This entry was posted in About Brendan Ball, The Tour Blogs & Brendan's Solo Blogs and tagged "Deep Purple", "Jon Lord", "Royal Liverpool Philharmonic Orchestra", 'Brendan Ball', 'child in time', 'Concerto', 'Durham Concerto', 'flugel horn', 'RLPO', 'Rock Group', 'summer pops', 'to notice such things', 'When two worlds meet', Classical music, Durham. Bookmark the permalink. Brendan, I could have sworn the encore was “Pictured Within” – with that wonderful cello intro.